THE EVOLUTION HAS BEGUN . 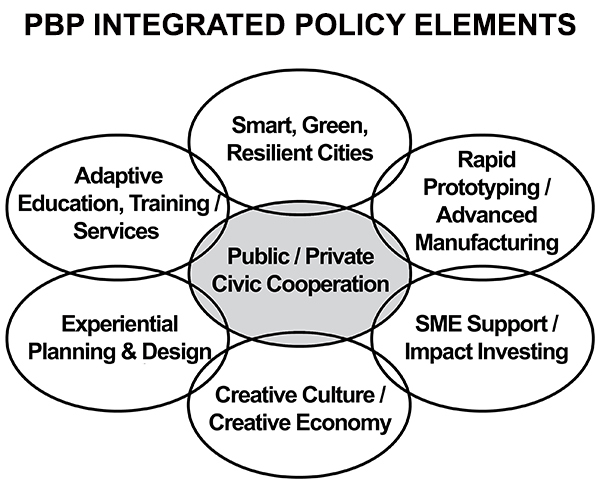 . .
Program-Based Planning (PBP) merges economic development and civic engagement strategies with integrated design thinking to create thriving urban innovation ecosystems. Urban communities are living systems that pulse and flow with the energy of local values, activity, and culture. 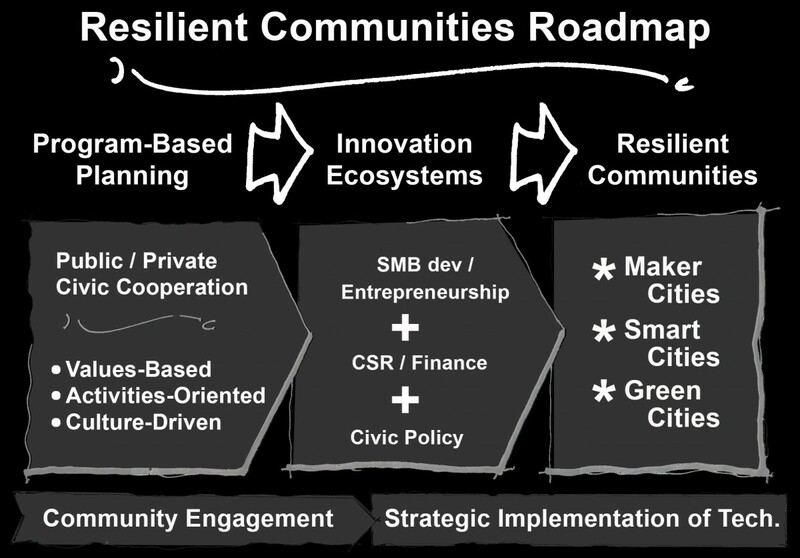 The day-to-day life of healthy communities is a myriad of incremental and subtle manifestations of public/private civic cooperation, where private enterprise has the capacity to thrive if nourished by access to high quality public services, reliable state-of-the-art infrastructure, and progressive development policies. Traditional land use planning takes a two dimensional approach to community development, manifest in zoning maps that regulate adjacent land uses for compatibility and access without regard for architectural form, open space character, and the qualitative nuances of mixed-use dynamics. Traditional economic development practices prioritize financial returns and the expansion of the municipal tax base over investments to attract and retain invaluable local human capital, and promote local cultural identity. The reemergence of Form-Based Code (FBC), gives community planners the tools to more effectively address the spatial third dimension of building and block forms, as well as architectural detailing. VALUES-BASED; focusing on local citizen engagement, business development, and investment strategies that are formulated to reinforce local ethics, character, and development priorities to realize the latent potential of the local community while developing diversified, dynamic, and sustainable economies. ACTIVITIES-ORIENTED; incorporating a diverse mix of business types, recreational facilities, and cultural events (e.g., fairs and conferences) organized at a district level to facilitate active engagement of public open spaces; improving civic cohesion, supporting active and healthy lifestyles, and attracting the evolving entrepreneur and creative class. CULTURE-DRIVEN; celebrating the unique cultural fingerprint of each district, and the city as a whole, by cultivating initiatives, supporting organizations, and promoting public events that reinforce local history, culture, and design sensibilities (e.g. architectural styles), while also promoting community lifestyle and development aspirations. 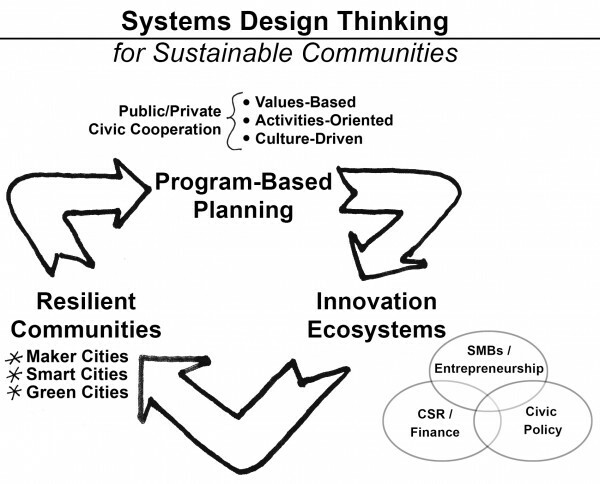 Program-Based Planning extends economic development and urban planning to the fourth (programmatic) dimension, prioritizing the value of local human resource development, impact investing, cultural identity, and environmental quality to be on par with financial returns; recognizing that growing robust economically sustainable communities means cultivating and maintaining of a thriving and diverse innovation ecosystem where creativity, cooperation, and civic engagement are the cornerstones of economic vitality.